Scott grew up in the Washington D.C. area. The child of two artistic parents, a graduate of the Portland School of Art, Scott works in both oils and pastel. His interest in the outdoors provides a unique perspective on landscapes where the character of light is very important. Scott lives on the Maine coast where a converted post office provides his private studio space. 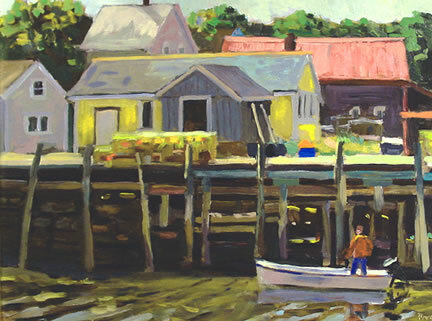 He exhibits at Argosy Gallery, Bar Harbor, Clark House, Bangor, Bayview Gallery in Camden & Brunswick, McGrath Dunham in Castine, Maine Art in Kennebunkport, Powers Gallery, Acton, MA, and Richardson Gallery, Charleston, SC.